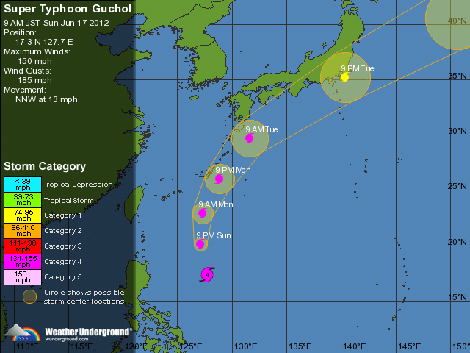 Super Typhoon Guchol will be passing near Okinawa (or even hitting us directly) from mid Monday to early Tuesday. This has the potential to be dangerous so if you’re new to Okinawa here are a few things that you need to do (and probably should have done already). Tidy up the outside of your house or garden. If it can be picked up and carried by 150 mph winds, you don’t want it outside. A patio chair flying through the air is not a good idea. Buy supplies. Charge batteries and buy new ones. Typhoons have the potential to take out the power supply for hours or days. Not too bad during the day, but a real pain if you’ve not got working flashlights at night. Buy food and bottled water for a few days. Rent some DVDs but also have some books ready if the power goes out. Fill the bath or containers with water. Water supply can go out. A bath full of water, will allow you to flush and refill the toilet. Have towels ready for when the water manages to find it’s way around door and window seals. In a typhoon rain is often traveling horizontally and at high speed. Going outside to take photographs or view the crashing waves along the coast is risky. Misjudge the situation or the waves and you’re in serious trouble. Any other good ideas? Please add them in the comments. Know how to turn off your gas supply manually and reset the emergency cut off switch. Perhaps a good opportunity for a trip to Osaka? We never seem to get hit around here. Or Manchester – can not remember the last typhoon. Bording up your windows is not a bad idea, as the debris that can hit your feet, or body, when you’re outside, can as easily come crashing through your windows! And keep the curtains closed, as that’s another good way of stopping people getting hurt from shattered glass. Some of the houses around here have bars on the windows to prevent large pieces of debris hitting the window. I shall simply close the curtains!